Many years ago AZCO pioneered a complete and fully automatic (ORP controlled) system for the bottling and food processing industry. It has been proven beyond a doubt that only a fully automatic system, with a close loop programmable ORP control, can assure 100% consistency in the water quality and disinfection. These systems are in operation in Canada, the US, Mexico, Europe and Asia. References are available. In these applications AZCOZON ozonation systems provide complete elimination of bacteria, viruses, fungus, and parasites, the removal of oxidable metals, chemicals, and organic waste. Unused ozone breaks down into oxygen and stays dissolved in the water ? adding to the taste and appearance of final product. The dosage of ozone at the point of filler is very important. If the ozone level is too high, plastic bottles may develop an aftertaste. If the level is too low, bacteria spores hidden inside the plastic walls will recover and easily contaminate the whole product. The proper ozone level residual dosage has been legislated by many states. Water charged with ozone is also suitable for rinsing bottles, cleaning and disinfecting of the equipment (such as milk processing machines) cleaning and disinfection of the production facilities. Thanks to AZCO's ozonation systems, harmful chemicals have been eliminated from many food processing facilities. 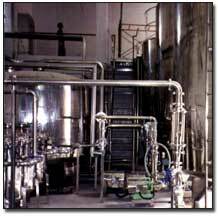 In many kinds of food processing operations chemicals cannot be used at all. Before the use of ozone, Salmonella and Lysteria have put many of these food processing facilities out of business. Ozone provides 100% protection without interfering with the food quality and without leaving any chemical residuals. Residual ozone decomposes quickly back to oxygen. 1. Single pass water treatment where the water is first distilled or R.O. filtrated. Here ozone is mixed to dissolve to the level needed for the 100% disinfection of bottles and caps after filling and sealing. If the bottles retain their seal, the water will maintain its quality even after virtually unlimited storage time. Even after many years of storage, this water will taste just as fresh as the day it was sealed. The procedures for achieving these goals are simple and easy to achieve in real life conditions. There are hardly two identical process operations in the world. AZCO's engineers are ready to review and utilize your existing equipment (such as storage tanks, pumps, filters and buildings), to be fitted for their new purpose. In order to do so most efficiently, please answer the attached Water Bottling and Food Processing Questionnaire. Your answers will be kept in strict confidence. The systems are engineered for fully automatic and worry-free operation. Many features are included to guarantee smooth passage through the approval process by local authorities (such as health inspectors and workers safety). Any single failure will not result in an unsafe product or in damage of any kind. 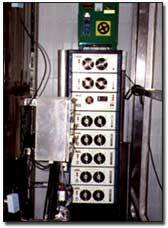 The ozone generators must be installed in a well ventilated and dust free room. In most cases only a few square feet of floor space is needed. Detailed instructions for installation and operation will be provided after the project is ordered. The systems are easy to operate and maintain. The overall warranty is for three years, except on the pumps where the manufacturers warranty is applied (generally one year). AZCO Industries Limited can supply complete turnkey systems which are designed to fit every size, layout and model of water bottling operation. AZCO's modular system allows easy expansion and interchanges. In case of a partial failure, the system ORP controller just increases the duty of the system until repairs are made. There is no worry concerning on-site repairs. The entire Ozone Generating Module is easy to remove and fit into a subcompact passenger automobile. It is easy to ship and handle. Please feel free to contact our Engineering Department for details.